More than 50,000 cases of midwifery-led care will now be available to researchers thanks to the validation of the MANA stats 4.0 dataset. 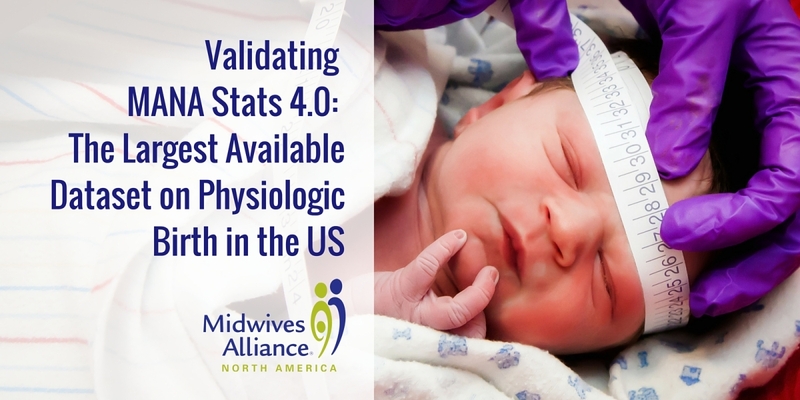 This key achievement makes MANA Stats by far the largest available dataset on physiologic birth and midwife-led care in the United States. Of particular interest to researchers is that MANA stats is based on medical records, which are considered to be the "gold standard" of health care research. "Validity" is a statistical term that means, essentially, that the data are accurate. In this case, it means that the MANA Division of Research (DOR) selected a random sample of 10% of the records in 4.0, and checked them against the original medical records. We now know which variables in the 4.0 dataset are extremely accurate (cesarean, for instance, is almost always entered correctly), and which variables are slightly less accurate (labor duration has a little more "wiggle room" in it).DOR members are currently analyzing the validation findings, and plan to submit a validation paper for publication in the near future. These steps are time-consuming, but critical, because they ensure that the data can be used by academic researchers in studies for publication. MANA Stats datasets include some of the only U.S. data that exists regarding physiologic, low-intervention labor and birth -- data that are becoming more and more rare due to the ubiquitous use of "routine" interventions in the hospital setting. The MANA Stats datasets are a source of information on outcomes of midwifery care, normal lengths of pregnancy and labor, non-pharmacological approaches to pain management, mother-led birth positions, hydrotherapy in labor, and more. The MANA Stats datasets have been provided to every researcher who has applied to date. These investigators engage research projects designed to explore midwifery care and normal, physiologic birth processes. Learn more about published studies using MANA Stats data and approved projects here. Next up for validation: the MANA stats 3.0 dataset. The 3.0 data form had the largest number of variables available, which led to a uniquely rich - but more challenging to process - dataset. This effort is being led by Saraswathi Vedam and Kathrin Stoll at the University of British Columbia. As a home birth midwife passionate about the work that I do and the deep belief that physiologic birth and the Midwives Model of Care is critical for the health of birthing families, I am ever grateful for the untiring work of the MANA Division of Research who donate thousands of hours to this effort, giving us information that can inform our individual practices and the bigger picture health care system that seems hell bent on taking birth away from those families! With the information gleaned from the research available change is bound to be able to happen. THANK YOU, DOR!